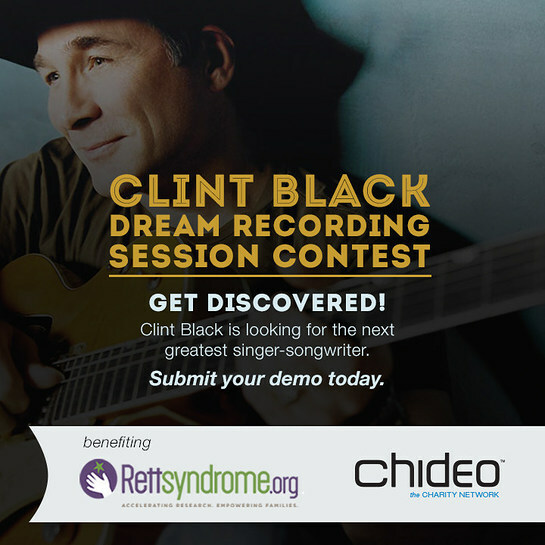 Chideo, the charity network, and country music legend Clint Black want to find the next great American singer-songwriter, and hope to generate a whole lot of support for Rettsyndrome.org in the process. Black, partnered with Chideo, is offering the chance of a lifetime to aspiring singer-songwriters – the opportunity to record an original song with the country artist in his personal studio with some of the crooner’s favorite musicians. The Clint Black Dream Recording Session Contest launched Sunday in conjunction with the 50th Anniversary of the Academy of Country Music Awards (ACMs) and concludes with the debut of the winning single and music video exclusively on Chideo. Fans who follow Black on Chideo will receive contest updates and behind-the-scenes content from Black and the contestants throughout the summer. •	In exchange for a $20 donation, artists may submit a video via Chideo of themselves performing their original song. All submissions must be received by 11:59 p.m. EST on June 2, 2015. •	Black and his team at The Collective will review all submissions and select four finalists. •	The finalists’ videos will then be featured exclusively on Chideo from July 17 to July 29, where fans can vote on their favorite. •	The winner will be announced on July 30 and flown to Nashville for the recording session, video shoot and an audition with Black’s management group. •	Chideo and Black will host an exclusive premiere of the song and video with proceeds benefitting Rettsyndrome.org, whose mission is to accelerate research to cure Rett syndrome and empower families with knowledge and connectivity. Rett syndrome is a unique postnatal neurological disorder that is recognized in infancy and seen almost always in girls, but can be rarely seen in boys. Every two hours a girl is born with Rett syndrome, but very few people know anything about the disorder. Affecting 1 in 10,000 live female births each year, it is more common than Huntington’s disease and Muscular Dystrophy. Black currently serves as Honorary Chair for Rettsyndrome.org’s “Research to Reality: Funding Progress” campaign, which helps to accelerate treatments and research to find a cure. For complete contest details and to enter your video, please visit Chideo.com or download the free Chideo app, available for iPhone, iPad and iPod touch at www.appstore.com/chideo, and for Android devices here.